In the year since, it’s sold nearly 200,000 copies, including 8,000 ebooks in one week in May. It made the Wall Street Journal bestseller list “organically” (which is to say, accidentally). It received more than 500 reviews on Amazon, 450 of which are five-star. And it’s been the number one book in the business/coaching category for about 95 percent of the year. More importantly, it’s also tripled the number of sales inquiries for my training company, Box of Crayons — we give busy managers the practical tools so they can coach in 10 minutes or less — and as a result, our revenue is up 82 percent from this time last year. All from one book. So perhaps you’re considering writing a book yourself, or you’ve gone as far as to have a first draft in a digital drawer somewhere. We’ve all seen our marketing heroes grow a base of fans, then customers, then empires through “content marketing.” And the big kahuna in content marketing is the book. This is how you officially rise to “Thought Leader” status, it’s how you differentiate yourself from your competitors, you drive revenue, you launch your speaking career, you start hanging out with other cool authors. Easy enough, right? As with most things involving your business, it’s a bit more complicated than it seems. Writing a book is a long, lonely, and oftentimes unsuccessful endeavor. My “instant success” was anything but. The Coaching Habit was the result of four years of floundering, rejection, and toil. So you don’t make my mistakes, allow me to share everything I used to vault my book from idea to bestseller (with a table of contents to skip to what you’d like to know). But first, a story of failure. In 2010, I fell into a book deal with a fancy New York publisher. It happened remarkably quickly. I was planning to self-publish my second book and had printed a small run to send out to my friends for their feedback, a final step before I hit the “All In” button and printed several thousand. One of those friends, Nick, sent his copy on to his publisher who got excited and called me. I got excited, and told them they had 48 hours to make an offer, given the impending big print run. They got flustered but made an offer. And in less than a week, we had a deal. Do More Great Work was launched, and it’s done well. In five years, it’s sold about 90,000 copies, and people who like it love it. I had my first experience with a publisher, and it was mostly good. There were the usual disappointments about design compromises (a little gap), and about what they thought of as marketing (a much bigger gap). Courtesy, as well as my contract, obliged me to offer my next book to this publisher. And this time, rather than “Accidentally Do It Myself” like last time, I thought it was time to get an agent. Because that’s what “Real Authors” have. After talking to a few, I found someone who I considered smart and strategic, and who had an impressive roster of business authors. I signed up… and quickly entered a special kind of purgatory. So I tried to write the book that I thought they’d think they might love, if they knew what that book was, which they didn’t. Another miserable fail. And I wrote at least one other full-length version of the book somewhere in there as well, also rejected. It was a colossal waste of time that I could have spent growing and improving my business. I had lost my way. It crossed my mind more than once that I should be spending my time on something, anything, more productive. You know, marketing, sales, that sort of thing. I really really REALLY wanted to give up this book-writing thing. Except that I couldn’t shake off the idea that this could be a really good book, if I only stopped trying to write the book that I thought they thought I thought they thought I thought they thought I should write. So, I found my way back to what I wanted this book to be. I got back to basics. First, I remembered whom I was writing it for, my customer. My community. I wanted to help busy, engaged managers doing their best. Though I also wanted the book to have universal appeal. I wanted to write something elegant and practical. I looked to some role models. Austin Kleon’s Steal like an Artist felt like a perfect blend between design and content. Seth Godin’s books Purple Cow and The Dip had the discipline to stay focused on a single idea. Bill Jensen’s The Simplicity Survival Handbook was brilliant at turning theory into practical tools. I’d found my way back onto the path. I knew what I wanted to do, I knew what I wanted to write. I laid down a deadline with my publisher. I shared my vision for the book, and I gave them a deadline. December 31, 2014. They were either In, or they were Out. …And it turns out, they were Out. The rejection was actually one of the best things that could have happened to me. Though, in the moment it certainly didn’t feel that way. For a while I considered pitching to another publisher. But I knew that even if I found one, it would take 12 to 18 months for the book to make its way through the labyrinthine process of publication, and it felt like I’d already wasted three years. I was going to self-publish. This fit with the reason I’d started Box of Crayons in the first place. I wanted to control the look and the feel of the experience. I wanted to decide the risks I took. I wanted to be able to shake things up if I wanted to. Why not take the same approach with my book? I’d self-published before. This time, though, I was determined to publish as a professional. I wanted everything that a regular publisher would contribute — top-notch editing, design, distribution — but without any of the timidity and the “do what we’ve always done” spirit that so often comes as part of the deal. Amazon is a graveyard of $5 ebooks churned out by a single author with little oversight or guidance. I wanted my book to be the next level, better than anything you could find at your bookstore. But to do that, I had to focus on the writing and delegate the rest. And I had to be prepared to invest, to spend at least $20,000. So, I built a team. I asked Seth Godin to introduce me to his editor, Catherine Oliver, and she quickly took me through three rounds of deeply helpful editing, first shaping the book, then applying finer grades of sandpaper to make it eloquent. I was determined to make this book feel welcoming through its design. I researched award-winning Canadian designers and quickly found Peter Cocking. We started with the book cover, and we started poorly. Of the first 20 covers Peter created, I liked exactly zero. It was Peter who introduced us to what would prove to be our secret weapon, Page Two Strategies. Jesse, Trena, and the team are veterans of the publishing trade, and they specialize in helping people self-publish as professionals. Their ideal client? Basically, me. Someone who has a book or two under their belt, who knows a bit about marketing and who wants the best of both worlds, traditional publishing and self-publishing. Page Two took the lead on project management for the book’s production (a blessing, as I get quickly bored of the minutiae), as well as securing us our distribution partners in the United States (Greenleaf), Canada (Georgetown), and beyond. Distribution was to prove critical: that’s how your book gets beyond Amazon and into bookstores and, if you’re lucky, airports. They found our final proof editor, Judy Phillips, who worried about the tiniest error in the text. They also introduced us to Carlyn at Post Hypnotic Press, who went on to produce and publish the audio version of the book (and which has been a surprise success for us: we’ve sold 30,000-plus audiobooks so far!). Ten months after declaring I’d be striking out on my own, we received the first print run of the book. This would normally be considered the ARC — advance reader copy — basically a rough cut of the final book. But our upfront investment in editing and design meant that our first draft was all but perfect. It was October, and we’d created something fantastic in only 10 months. We’d set the publication date for February 29, so that left us with just about five months to prepare for launch. Despite appearances, your favorite authors don’t write a book alone in a cabin in the woods. A book, like any other product, requires a talented team of people, especially to rise above the OK-ness of a typical self-published book. From here, I had to build an internal team, one that would help me on my plans to bang the drum, wave the flag, and help the world notice that I had a book. More on that team below. Expect to spend between $3K and $5K on editing (depending in part on length), up to $3K on design, and between $5K and $10K for the services of a company like Page Two. To produce an audiobook costs between about $300 and $500 per hour of the book’s narration. Just so you know how the money works, for my first book Do More Great Work, which was published only as a paperback, I was paid an advance of $15,000 (which I was THRILLED about) and a royalty rate of eight percent for full-price books (this does not include those sold at a bulk discount rate). The book sells for between $10 and $15, depending on how Amazon is feeling, which means I earn about $1 per sale, plus-or-minus 20¢. In the six years since it was originally published, it’s sold about 90,000 copies, meaning I’ve easily earned out my advance, and I get checks once or twice a year from the publisher (checks that get smaller each time). For The Coaching Habit, I had to invest a bunch of money upfront (more about that above) and had to spend a bunch of money on the launch and ongoing marketing (more about that below). However, the economics of this book, if I can sell it, are much better. It costs me between $1.50 and $2.00 a copy to print it. It costs me money for shipping and storage. Our distributors pay us 60 percent of the sale price. The book sells for between $11 and $15, so that means I earn between about $4 and $6 for each print copy sold. The Kindle version sells for $5, and we get 70 percent of that from Amazon, so about $3.50 per copy sold. That’s anywhere between 300 and 500 percent more than I’d get with a traditional publisher! The time to think about launching and marketing your book is not when you’ve finally got the thing written. It’s as soon as the idea for writing a book crosses your mind. Others, like Jonathan Fields, Chris Guillebeau, and Danielle LaPorte, continue to be savvy and interesting in the way they make news and build community and fans. I kept saving articles, ideas, and examples to my Evernote account, tagged “book marketing.” And I forced myself to add to those ideas I was going to borrow from others and come up with my own. I carried a notebook around with me, and had a phase when I forced myself to write down 10 new ideas about book marketing each day, an idea I got from James Altucher. Be the shortest book I could write that would still be useful. It’s 26,000 words, and I’d claim that there’s not a flabby paragraph to be found. Have my “voice” and my sense of humor come through. One of my favorite bits of feedback to hear is that people actually laughed out loud while reading the book. Be based on research. Too many books are based on a “this happened to me, therefore it must be a universal truth” way of thinking. Refuse to recycle the same old stories and research found in other business books. Southwest Airlines isn’t mentioned once (bless them), and we hired a researcher to do original research. People who set a target number of books they’re going to sell don’t know what they’re talking about. Yes, I’m talking about professionals who are in the publishing business. That’s the reason such a high percentage of authors don’t earn out their advance, even though those advances are getting smaller and smaller and smaller. But that didn’t stop me trying — “10,000 copies in the first … No, how about 30,000 copies by …” Finally, I admitted I was just randomly making up numbers. But when I sat with the question, I realized that real success wasn’t about numbers or bestseller-list status, but reputation. I wanted this book to be considered a coaching classic. When asked “What’s a good book on coaching?” I wanted The Coaching Habit to be one of the two or three books always mentioned. That’s it. No sales figures needed (though it would be nice to make my money back). Everything I did would be in service of making my book as helpful as possible. That felt real and aspirational. And, most importantly, it helped me decide what to pursue and what not to pursue. Paradoxically, it was also essential to remember that the purpose of my company wasn’t about selling books. It was about selling our award-winning training programs that help busy managers coach in 10 minutes or less. I didn’t want to get seduced into thinking selling books was the only prize to be won. Requirement: Willingness to sit with the question about what matters and remember the longer game. You know how on a book’s front cover there’s a short blurb or quote from someone vaguely famous saying, “This book is brilliant!”? And then there’s another six blurbs on the back cover. And then another 20 on the inside pages. I didn’t not do this. But my twist was, rather than chase lots of other authors, I focused on people I know who worked in organizations that people had heard of. It meant that I could say my book was endorsed by leaders from over 70 companies (you can see them here). Why does that matter? Because of Box of Crayons’ success criteria. We want to give busy managers the practical tools to coach in 10 minutes or less. So we want to reassure people in organizations that we know what we’re doing — not necessarily that we happen to know lots of other thought leaders. That said, I also reached out to some Big Names. Brené Brown. David Allen. Bob Sutton. Dan Pink. What I had going in my favor is that these are all people I’ve been in touch with for at least five years. I’ve had them on my podcast to help them promote their own books. I’ve found a way to meet them when we’ve been in the same city at the same time. In short, I’ve been able to be a champion for them in my own small way. So I was able to ask for a favor in return, to which they were all gracious enough to say yes. Requirement: Willingness to reach out to people you may not know well. Willingness to build relationships with people over time and to be an Adam Grant–esque giver, rather than a taker. Willingness to ask people you do know to do you a favor. There’s an anxiety that comes with launching a book. “I want to hit the bestseller list” translates into “I’ve got to sell a boatload of books,” which translates into “I’ve got to sell a boatload of books in the first couple of weeks,” which translates into “pour every iota of time, money, and effort into the launch, then collapse in a heap and hope for the best.” It’s exhausting and ultimately pointless, because nearly every book won’t be on that elusive bestseller list. Figuring out our criteria for success (points one and two above) allowed us to avoid that hamster wheel of misery. We set our goal — for the book to be considered a coaching classic — and found a metric that inspired us (1,000 reviews on Amazon), then rolled up our sleeves, knowing that we were playing the long game. Reaching out to podcasters and bloggers, and asking if they’d like a copy of the book and if they’d like me on their show. Reaching out to hubs and offering to write guest posts. Looking for opportunities to give the book away. Looking for potential partners who might be interested in helping others get excited about the book. Podcasting. Our goal has been for me to record two podcast interviews a week. That’s meant that my head of outreach, Jackie, has been identifying podcasts that might be a good fit, pitching them, and scheduling me. And it means that I’ve got to keep my calendar open, so that I’m able to fulfill this obligation. Writing articles. Our goal has been to write and pitch at least one article per week. Sometimes I’ve written them, sometimes Jackie’s written them. To tell us where the topic hotspots are, we routinely review the book’s most highlighted sections on Kindle, which helps us know what we should be digging into more deeply for ancillary content. One thing I’ve learned: It’s delusional to think I can launch a book by myself. It’s deluded because I don’t remember that almost everything I take credit for is already being done by others; and it’s deluded because I still believe I have endless energy and capacity, when in fact I’m overly tired and overly busy, just like everyone else. Marcella, who managed the behind-the-scenes operational requirements (e.g., “We’re running out of books! Print more!”). Shannon, who was our first outreach champion and who bore the burden of the launch. Jackie, who took over from Shannon and has continued weekly outreach. Charlotte and Denise, who run marketing for Box of Crayons and who’d be organizing the email campaigns for BookBub (see below). Sonia, who built the book’s web page. Requirement: Clarity on roles and what skills are required to deliver. The typical approach of most publishing houses to sending out advance reader copies of the book is that the marketing or PR department sends out a standard email to a vast list of bloggers and podcasters and influencers, offering to send them a copy. I know, because I get these daily. These appeals are somehow breathless and bland at once. If you say “yes” to the book, they kindly send you a copy and then hope somewhere down the line you read it and mention it somehow. This strikes me as a huge waste of time and effort. The outreach is not thoughtful or targeted. Most of the time, there’s no follow-up to those who’ve received a copy of the book. We decided to be more thoughtful with our time and money. We decided to find the people who might actually want to write about our book. Step one was to identify a book that was similar but different from mine, a “cousin” book, and one which had been a big success. I started with Dan Pink’s Drive. Super smart, and it seemed to get a ton of good press. Similar to mine, but not quite a one-for-one comparison. I then jumped onto Guru.com and hired a researcher. Her task? To find the top-ranked 50 articles or reviews about Drive, the name of the reviewer, and their contact details (email and/or Twitter). When we had that information, we then wrote to each one, referencing the article they’d written, saying that The Coaching Habit might be of interest to them, telling them that Dan Pink had written a nice blurb and offering to send the book to them. We then followed up. And followed up. And followed up. (You can see how we tried to strike a pleasant-yet-persistent tone in the templates here.) Nicely, of course. There was no obligation for the person to read the book or write about it. But I wanted to give us every chance of having the book considered — and them, every chance to consider it. About 30 percent of those who got a copy of the book generated some sort of press component (podcast, article, social media mention, review). This was a hit. And when something works, do more of it. Using a combination of scanning the Amazon business bestseller list and the fact that I read a lot to find good guests for the podcast, we identified possibilities. We followed up with Greg McKeown’s Essentialism, Charles Duhigg’s Power of Habit and Susan Cain’s Quiet. Then Marshall Goldsmith’s Triggers, Eric Ries’ The Lean Startup and, finally, Adam Grant’s Give and Take. As a strategy, this worked better when the book was recent and closely aligned (Duhigg’s Habit worked particularly well, as it ticked both those boxes). Through this strategy, we sent out more than 450 copies to people who had actually asked for the book and knew why we were sending it to them. And because we had the book ready to send five months before its launch, it meant we were able to get some wonderful press, for example with Forbes, Fortune, Business Insider, Huffington Post, the Globe and Mail and Fast Company. 1,000+ emails sent (none sent in bulk). 40 percent of people emailed asked for a copy of the book. 450-plus copies of the book sent. 30 percent of those who got a copy of the book generated some sort of press component (podcast, article, social media mention, review). Requirements: A simple system to track and chase. Someone on the team who’s willing to follow up and follow up and follow up and not get discouraged. Cost: $5–$10 per book sent out (book + postage); research @ $2 per name. Team member following up at $15–$20 per hour. I’ve been doing the Great Work Podcast for a long time. Throughout its six years, we’ve interviewed more than 350 cool, smart, savvy, and often influential people. Many of them are writers of business books (you can see the whole list here). You probably understand the concept of reciprocity, the primary idea from Robert Cialdini’s seminal book Influence. (Here I am talking to him about it.) If you give, people will want to give back. I hadn’t been doing six years of interviewing just to build up reciprocity. But at the same time, I was going to ask for help. We offered bloggers and journalist 12 angles on the book (download the pitch document here). We offered podcasters and interviewers plenty of questions to ask (here’s what we sent them). We offered anyone and everyone a synopsis of the seven questions (like this). Requirements: Thinking hard about what would be most useful for writers and interviewers, and what would most effectively remove any possible barriers to them engaging with the book. Cost: The time and effort to craft something useful for writers and interviewers, rather than the usual rubbish PR releases that are written as if anyone cares that another book has been launched into the world. For the first two, our Page Two team worked relentlessly to get them to notice us and then champion us through persistent follow up. (Seriously, Woody Allen had it right when he said that “80 percent of success is just showing up”). We had great success in particular with getAbstract, and The Coaching Habit ended up being its #2 business-book download for 2016. Soundview elected not to do a summary of the book but did host a webinar. With the final two, we’d already built a relationship with the founders of both of these organizations, so we were able to rely on our friendship to have them promote the book. They both offer a great service and have an engaged community of readers, and they definitely helped us get noticed. Requirements: Identify potential hubs for people finding out about your book. Pitch them. Pitch them again when they don’t respond to your first pitch. BookBub is a service that promotes discounted ebooks to a large, segmented email list. It does a lot of fiction, but there’s a place for nonfiction books as well. We decided to double down on this. We did some research (i.e., we Googled “How do you run a good BookBub campaign?”) and ended up applying to other sites that did a similar thing to BookBub: Books Butterfly, Genre Pulse, World Lit Cafe, Kindle Nation Daily. We also invested in a mail-out with the SelfGrowth.com mailing list, which is about 200,000 people strong (or so it says). This was a fantastic success. We hit #1 business book on Amazon, which was thrilling. And then about a week later, I woke up to find that we’d hit #3 on the Wall Street Journal list for nonfiction ebooks. We’d sold close to 10,000 copies of the book in that week, and it had nudged us On To A List. Requirement: Strong application to BookBub (it accepts only about 10 percent of applicants), plus some good luck to get selected. The courage to double down on the opportunity and find ways to amplify the promotion. Cost: $250 for BookBub + about $300 for other services like BookBub, announcing the discount + $1,500 for mailing out to SelfGrowth.com list. So, a problem with my big picture goal: how do you define a classic? It’s hard to pin down. It’s elusive, it’s got a certain je ne sais quoi. But there is one way to measure success: Amazon ratings. I know there’s not a direct correlation, but when I look at books I consider business classics, they’ve all got over 1,000 Amazon reviews — 1,000! That’s A LOT of reviews. But as a team, we set ourselves a goal: 1,000 reviews within a year. It turns out there’s no way to get there fast without just plain asking people. When people reached out to me on LinkedIn or Twitter, saying they liked the book, I thanked them … and asked if they’d consider writing a review. The quest for Amazon reviews has been a very successful failure. We got halfway there. More than 500 reviews! Amazing. And we’ll keep pushing hard to get to 1,000. Requirements: Shamelessly asking people to consider adding a review on Amazon. See the three examples in this very article. The final strategy that was particularly important to us was getting into airport bookstores. I was hoping that would sell books, sure. But more importantly, I wanted ours to be a book that would catch the eye of potential clients of our coaching programs — typically VPs of HR, or VPs of Learning & Development. These are the kind of people that make a living in airport gates the world over. It was a brand-building and new-business move more than it was a bookselling move. The starting point was to create a book that was airport-friendly. The size (small enough to fit in a purse), the design (lots of white space — appealing if you picked up the book and flicked through it — rather than an intimidating block of text), the length (my goal was to write the shortest book I could that was still useful; it came in at about 25,000 words) all emerged in part because I knew I wanted it to work in airports. The next step was to have our distributors, Greenleaf in the United States and Georgetown in Canada, pitch the airports. Both were successful, though not quite as fully as I’d hoped — quite frankly, it’s been killing me that we couldn’t get the book into my hometown’s airport. We committed initially to a three-month block (March through May) and sold about 2,000 copies in that time. The cost is about $3k – $4k per month, so it’s something of a “loss leader” for us. Because we also generated a number of inquiries about our programs from airport sales, it’s worth having the books out there to catch the eye of potential buyers of our training programs. If your audience isn’t the business traveler, I suggest skipping this step. But we liked the deal so much that we committed to another year’s investment, so you should be able to find The Coaching Habit in an airport in North America near you, even as we speak. Requirements: Having a relationship with a distributor who’s willing to pitch you to the airports. Having a book that’s airport-friendly. Cost: The initial relationship with a distributor will cost in the $2K to $5K range, and the distributor will also take roughly 40 percent of every sale it facilitates. The additional cost for an airport listing (with the book not necessarily showing up on one of the front tables, which costs extra) is between $3K and $4K per month. Ask any author and they’ll tell you what a disappointment PR has been for them. I’d experience that with Do More Great Work, where the PR support I got was random three-minute radio interviews with confused radio DJs who hadn’t read the book and didn’t care. I was determined not to waste money on this. Until I weakened. FOMO? Perhaps. But I hired a PR person for $3,000 and got the predictably disappointing results. One morning TV show in Toronto (glamorous, but I’m pretty sure none of my target market watches TV at 9:30 a.m.) and a few radio and podcast interviews. One of my most expensive efforts with the least results. Pass. Thunderclap is a clever way to coordinate your social media bang. The idea is that you ask people to sign up to support your campaign — in our case, the book launch on February 29. What then happens is that a message created by you gets sent out at the same time to everyone’s Twitter account. A mighty thunderclap of social media, echoing around the world! We had a bunch of generous people sign up — 223, with a social reach of 589,000 — and we Thunderclapped on February 29. And it didn’t seem to make much difference. On reflection, I realize now that it gave people a very low commitment option to support the launch. People who might otherwise have mentioned us on Facebook or on their blog or (the best option) to their email list quite reasonably took the easiest way out. As part of the launch week, we offered bonuses to people willing to bulk-buy the book. You can see the bonus page we created here. My vision was that hundreds of teams and organizations would buy copies of the book, I’d deliver one workshop and some webinars, and that potentially we could talk to the others about coming in to deliver paid workshops for them. In other words, a clever way to start some sales conversations while also selling loads of books. What did work was the PDF giveaway for a single purchase. I know people appreciated that, and I think it was a quick, easy win that encouraged people to buy the book. What didn’t work were the more elaborate giveaways. As it happened, only four organizations bought more than 98 books (and a big thank-you to them! ), and none of them turned into Box of Crayons clients. And we failed to make the most of Lee Crutchley’s fantastic postcards that we commissioned for this purpose. Cost: A day of my time to run the workshop; three 60-minute slots to run three webinars; $5,000 + printing costs for the postcards. One maverick publisher I spoke to (who asked to remain anonymous) said that part of the success he’d had with his bestselling book was due to his commitment to give it away. In fact, he said that in the seven years since first publishing the book, he’d given away more than 50,000 copies, to targeted conferences, to online communities and so on. I thought I’d try that and so set up a PDF download on Gumroad so that I could offer free and very inexpensive versions of the book. I was speaking at the big ATD conference (North America’s biggest conference for training and development, with more than 10,000 attendees) and paid $5,000 to put a flyer in every attendee’s swag bag, offering a copy of the book. I actually split-tested this: 6,000 of the flyers offered the book for free, and 4,000 offered it for 99¢. Part of the genius of this idea was that the front page of the download asks people to consider giving the book a review on Amazon, so in my imagination, we’d give away a ton of books, resulting in many reviews on Amazon (hello, target of 1,000!) and maybe even some sales inquiries about our programs. Turns out people don’t read flyers in the swag bag. We had a little more than 100 or so people download the book, equally split between paid and free. And none that I know of turned into clients for Box of Crayons. I do think there’s something very smart about giving the book away, particularly if your goal (like mine was) is to have it considered a classic. And if, like me, you’ve got a way of earning money that the book helps promote. But I haven’t really figured it out just yet. It can be a scary thing to write a book. First you have to endure the blood, sweat, and tears of actually writing it. That’s hard enough. And then you’ve got to figure out how to sell it in a world where content is free, ubiquitous, and very, very noisy. There are many points for possible failure. A majority of authors (the New York Times suggested it was 70 percent) don’t earn back their advances, which means the book sold less than the publisher thought it would. And the rest of us are all making it up as best we can, hoping that something sticks. That’s both depressing and liberating. Liberating because it means you can figure out what you want to do. Things I talk about above may or may not work for you. I encourage you to try to do a few things well, rather than a hundred things half-heartedly. I encourage you to build “a tribe” of people who know you and admire your work, so they’re already fans. I encourage you to have some fun. Oh, and I encourage you, if you’re feeling kind, to write a short review on Amazon of The Coaching Habit. 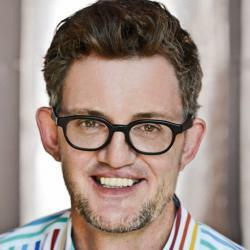 Michael Bungay Stanier is the founder and senior partner of Box of Crayons, a training company that gives busy managers the practical tools to coach in 10 minutes or less.